We offer a fantastic and pretty exclusive dog boarding service in London. We have a huge passion for animals and really care about what we do. 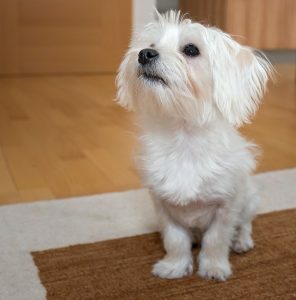 Small dogs are our speciality! Happywoof will provide your doggy with lots of love and attention during their stay and one to one care and your dog is treated as if they were our own. We always offer you a free meet and greet prior to any dog boarding to ensure a good fit. Its important to note we are not kennels and your dog is never caged during their stay. Visit our dog boarding page to understand more. The dog boarding price in London £45.00 for dog boarding on standard days. The prices includes complimentary pick up and drop off, two daily walks and of course lots of love and attention. On Bank and Public Holidays and NYE there is a supplement charge. Puppy boarding is £50.00. Doggies must be fully vaccinated and toilet trained. Dogs are collected for dog boarding between the hours of 9-10 am and dropped back around 10am. Payment is required on the first day of boarding. Due to the small number of dogs we take on a we need a minimum of 72 hours notice for cancellation at no charge. 48 hours notice will be charged 50% of price and 24 hours notice will incur 100% charge. Being a dog is great but can mean getting a little dirty sometimes!. If you would like to have your pet looking its doggy best when we drop them back off we can offer a lovely shampoo wash and dry. This service can be booked for the last day of boarding. The cost is £15.00. Or if you prefer us to take your cutie to the groomers and back we do also provide this service to you. The charge is £15.00.